Tunisian artisans gather rich, detailed olive wood to craft this sweet set of five coasters. Writer Lang Leav wrote, "Loving you is like being ten years old again, scaling a tree with my eyes bright and skyward." We couldn't help but think of these words when we saw this endearing set of wooden heart coasters. Artisans in Northern Africa handcraft each design from the rich, detailed branches of an olive tree. They are a subtle yet sentimental addition to your coffee table so that even the small details—like where to set your glass—are made beautiful. A sweet gift for a loved one, the set makes a delightful conversation starter. Handmade in Tunisia. Wipe clean with a damp cloth. 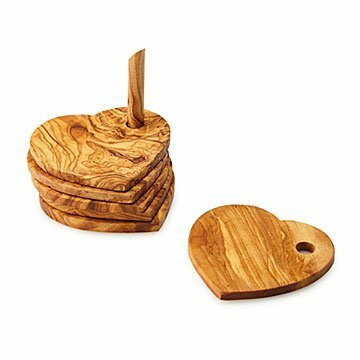 Occasionally, help condition and preserve your Olive Wood Heart Coaster Set with our Mineral Oil. The hole in the heart allows for moisture from glasses to seep through to table. Makes a beautiful hostess gift.